Place the sesame seeds on a large plate and roll the salmon in the seeds, pressing to coat all sides. Heat the oil in a large frying pan over medium heat and cook the salmon, in batches, for 3–4 minutes, turning, or until golden. While the salmon is cooking, place the silver beet in a large bowl, cover with boiling water and allow to stand for 30 seconds. Drain and place in a bowl of iced water to refresh. Drain and pat dry with a clean tea towel. 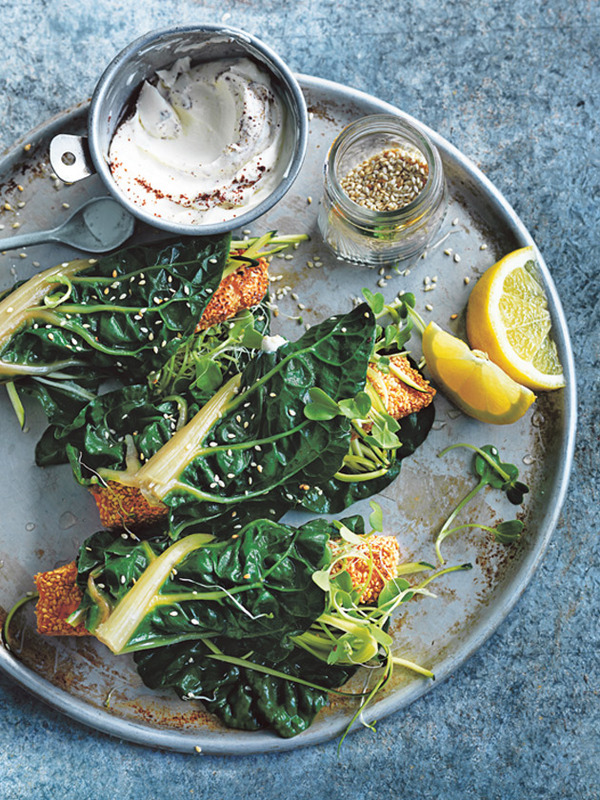 To serve, spread each silver beet leaf with 2 tablespoons of the labne. Top with the zucchini, salmon, radish sprouts and roll to enclose. Serve with lemon wedges. Makes 8. + You can substitute radish sprouts for any sprout you prefer.